BetterCloud's management and security platform supports multiple SaaS applications and offers extensive IT workflow automation. NEW YORK, Oct. 9, 2017 /PRNewswire/ -- BetterCloud, the company driving the SaaS-powered workplace, today announced it is included as a representative vendor in Gartner's inaugural "Market Guide for Cloud Office Management Tools" report. The report provides an outline of the cloud office management tools market and its offerings. Gartner analyst and report author, Terrence Cosgrove, notes that infrastructure and operations (I&O) leaders should, "Use a third-party cloud office management tool to get the necessary governance and administration to enable end-user adoption of cloud office functionality." According to Cosgrove, "cloud office management tools have six functional categories: administration, role-based access control, auditing, license management, workflow automation and reporting." BetterCloud has found that over 70% of organizations planning to run nearly all of their business operations on SaaS applications by 2020. Cosgrove writes that, "There are many management functions that are virtually identical across SaaS applications. Cloud office management tools can create a workflow that allows IT administrators to create an action once, and execute it across multiple SaaS environment. For example, the simple tasks "create a new user" or "place new user in the North America sales group" have to be done separately in each individual management portal. This repetitive work becomes increasingly time-consuming as organizations use more and more SaaS applications." 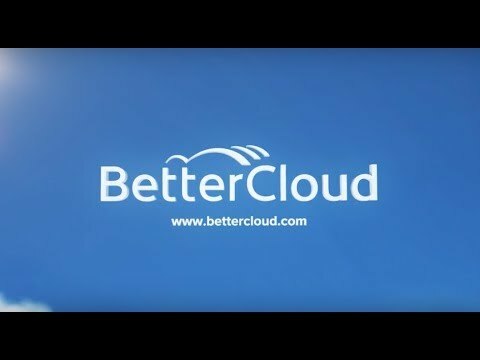 Delivering all six functionalities, BetterCloud is the industry's first centralized SaaS management platform focused on helping IT adopt and control the growing number of workplace technologies. It is the only solution to support multiple SaaS applications, including the popular services G Suite, Salesforce and Slack, as well as automate IT workflows. By taking this unique approach, BetterCloud enables enterprises to efficiently build, govern and operate best-of-breed tech stacks. "SaaS applications are innovating the way we do business, and it's critical for IT organizations to innovate their operations in parallel," said Shreyas Sadalgi, Chief Business Strategy Officer, BetterCloud. "At BetterCloud, our goal is to empower IT to run the SaaS-powered workplace, and we believe this report demonstrates the importance of our platform for IT operations teams in managing and scaling cloud applications across the enterprise. We are honored to be recognized in Gartner's first Market Guide for Cloud Office Management Tools, and excited to help IT play a strategic role in enterprise digital transformation and drive the future workplace that runs entirely on SaaS." [i] Gartner "Market Guide for Cloud Office Management Tools" by Terrence Cosgrove, September 14, 2017.